A poorly maintained commercial landscape could reflect your image since this is the first area seen by your clients. It is thus among the areas that give clients first impression about your business. And remember what they say about first impressions? They ultimately last. And for any commercial establishment to leave negative first impression in visitors and clients is undoubtedly bad for business. That is why it is important to hire professional commercial lawn maintenance people who have the skills and the right tools and equipment needed for the job. With such a critical undertaking, these two factors are what you should look for when hiring a lawn maintenance contractor. Luckily, we at Four Seasons Landscape Management possess these traits, which make us the perfect company to go for this particular job. Technical expertise. Performing commercial lawn maintenance is no small feat. Hence, it is important to hire a company that has the technical know-how in handling the various facets of maintaining a commercial lawn. And we have such competencies. We carefully assess the critical installations in your property like the irrigation systems, drainage, electrical, and the like. Additionally, we know how to take care of the greens (plants, trees, shrubs, flowers) so they remain healthy throughout the year. Right tools and equipment. For us, we believe that having the right tools and equipment to do the job fast is a top concern. With that, we have invested heavily on buying the so-called tools of the trade so you’re assured of positive results that you will definitely notice in your lawn. Skilled and adequate manpower. 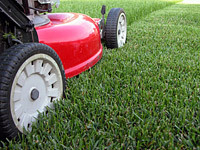 We have adequate number of people for most commercial lawn maintenance projects. And apart from the number, all of them are also certified workers with extensive experience doing tasks related to lawn care and maintenance. Whether you have a small commercial lawn or a big one, you can nonetheless put your full trust on us to deliver the results that you expect. Regardless of the season, you can bank on our company to render top-caliber commercial lawn maintenance services to help make your business area attractive to guests and clients. This way, you can look forward to a brisk business performance and continued success.